Less than a week after the confirmation that NASCAR would not be sending the Nationwide series to the Milwaukee Mile oval an alternative plan took shape in the form of the series' 3rd road course race for 2010. NASCAR Nationwide Series cars and teams will be unleashed on the picturesque circuit of Road America at Elkhart Lake, Wisconsin on June 19th. A 4-mile road course, Road America was created in 1955 as Wisconsin state law forbid auto racing competition to be held on public roads. Well connected to professional sports car racing, the track has been the site of AMA Superbikes and particularly Champ Car racing. 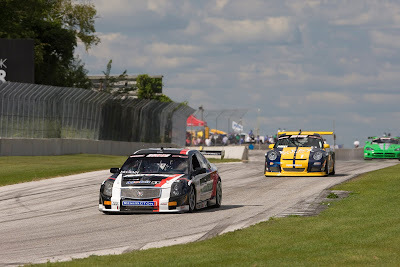 With the NASCAR Nationwide Series completely unaccustomed to the long 14-turn road course, this is not the first time that a NASCAR stock car series has visited Road America. 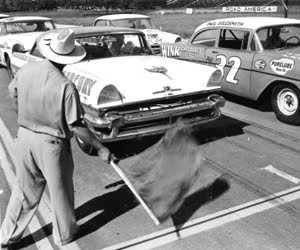 In 1956, NASCAR's Grand National division (which is today now as the Sprint Cup series) ran a 250-mile affair around the 4-mile Elkhart Lake road course. Future motorsport hall of fame driver Tim Flock took a Mercury to win the sole major NASCAR race. With 3 road courses to be on the NASCAR Nationwide Series schedule for the first time since 2008, this race promises to be another exhibition for non-regular NASCAR competitors. Described as Road Course Ringers, drivers with sports car racing and open wheel pedigree like Ron Fellows and Boris Said are going to be sought after talents for the event. More than likely, road course ace and Cup regular Marcus Ambrose will seek in opportunity to sink his sharpened race teeth into the long, winding Road America. However, this event's timing of June 19th comes one day prior to the NASCAR Sprint Cup road race at Infineon Raceway in Sonoma, California. While Kyle Busch and Carl Edwards made a trek to start every race in Cup and Nationwide in 2009, the logistics and driver's will are going to become challenges for this mid-year weekend. Preserving major stock car touring series race for the state, the departure from a one-mile oval to a four-mile road course is certain to be an entirely different race for not only the drivers and teams but for the race fans. Like a number of closed road courses, spectators are free to view the race from a multitude of areas around the track.